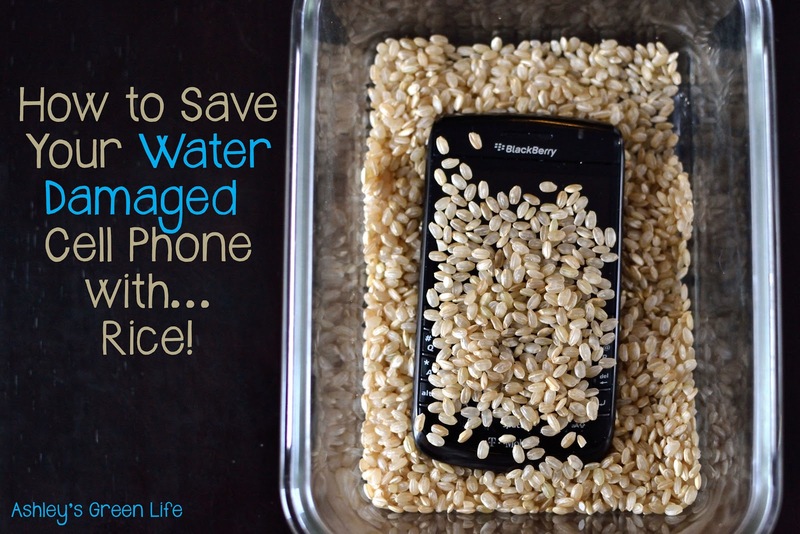 Ashley's Green Life: Save Your Water Damaged Cell Phone with Rice! The posts that come to you from my blog always come from interesting circumstances. Some I've been planning for weeks, others just pop in my head and don't leave. This one came upon me during the holidays and after seeing it work for me, I had to get the word out (even though I think a lot of you might already know about this one). As you saw by the title, I was able to save my cell phone from water damage by putting it in uncooked rice. Can you believe that? I didn't think it was possible, but my NOW WORKING phone is proof! Here's how it all went down, a few days after Christmas I was hurrying around the house and when I went to run an errand I threw my glass water bottle (which used to be a BBQ sauce bottle) in my purse and went on my way. When I got home, I looked down to see that the screen on my Blackberry Bold was white and my phone was wet...thank you halfway open water bottle! Now this lovely screen has shown it's self to me before, and upon Googling it, I discovered it was called the "Blackberry white screen of death." Awesome, right? Now being the problem solver that I am, I figured I would head right up to my local T-Mobile store and get a new phone. I wasn't looking forward to this because I wasn't due for an upgrade, and I didn't have extra insurance on my phone for a replacement. This left me with one option...buy a new phone. To my luck, I didn't have time to head to T-Mobile that night, instead I had a holiday party to go to with my family. While there I heard that my cousin had just dropped her iPhone in the toilet, while traveling that very day and after letting it sit in rice for a few hours, it was up and working again. Seriously...I thought? It can't be. I tossed the idea aside and figured maybe it just worked for iPhones and surely it wouldn't work for me. 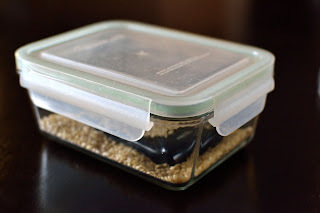 That night I mentally planned my agenda for the next day and before turning in for the night, I grabbed my "still white-screen phone" and threw it in a container with the little bit of uncooked, short grain brown rice I had in my pantry and went to sleep. The next morning I woke up, checked my phone and saw that the screen was black. "Hmmm...that's a change," I thought. But surely it was just because it had been awhile since it was dropped in the water. So I stuck the battery back on, and hit the power button...and a light came on! It started charging up and turning on-NO WAY! Sure enough, within minutes, my phone was back and good as new. No damage, no change, just a nice working phone that was repaired for pennies with simple rice. What's so great about rice? From my research it seems that the rice is able to draw out the moisture from the phone. 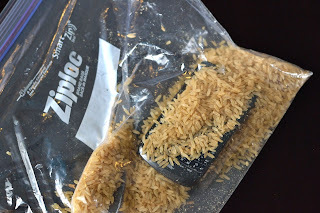 On top of that rice is cheap, simple and easy...so when you're in that waiting period to head to the cell phone store, why not stick you're phone in some uncooked rice and see if it can work for you. and some on the bottom. overnight, but you could try a few hours. 3. Hopefully the next step is to open the container or bag and then find a phone that you can turn on and that is back in working order! For phones like a Blackberry, do you take out the battery and memory card? 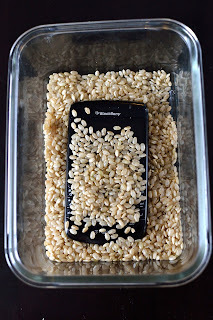 I think this is optional, I took my battery out in hopes that the rice could absorb more from inside the phone, but I know this is not an option for those of you with iPhones, so see what works for you. When to put it in rice...right after it happens or wait a bit? I didn't learn of the rice tip until hours after it had happened, so I only know what happens when you wait 5-6 hours. But I'm sure it's possible to put it in shortly after it's happened to start the "drying process".